China remains one of the most dynamic markets in the world, and foreign companies have a big role to play in the economy’s evolution. Here are a few industries that are poised for rapid growth. There are 1.34 billion mouths to feed in China, and that means big opportunity in a country where some local brands have suffered a series of food scares. Restaurateurs and specialty food retailers from abroad are winning big by targeting premium products to expats as well as China’s growing middle and upper classes. 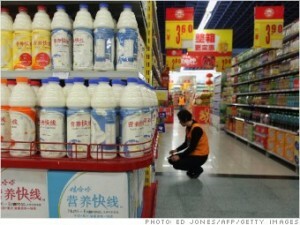 Still, prime supermarket shelf space is expensive, and companies have to build brand recognition, said China Market Research analyst Ben Cavender. Some of the biggest industry players are already in on the trend. U.S.-based Yum! Brands(YUM), which operates KFC and Pizza Hut, continues to invest in China, even purchasing a local hot pot restaurant chain in 2011. Last year, China accounted for 42% of Yum’s profit growth. Whether it’s private hospitals, prescription drugs or medical devices, China’s health care market is heating up and receiving key support from the government. China’s current five-year plan — a roadmap of Beijing’s priorities — singles out this sector for increased foreign investment and help from the government. Biotechnology R&D alone is supposed to receive $2 billion in government funding over a five-year period. Keying off the five-year plan is a way for foreign companies to see how they can work “with China in the same direction,” said David Schlesinger, founder and managing director of Tripod Advisors. Foreign medical device companies, however, will have to battle the perception that their products are more expensive than local brands, especially as the government aims to provide affordable care. 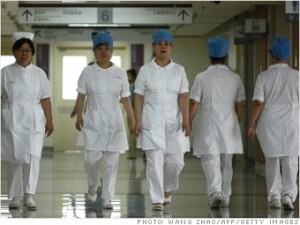 Aside from keeping the general population healthy, China also needs to cope with a growing number of senior citizens. More than 185 million Chinese are over the age of 60, which accounts for around 12% of the country’s population, a figure that will rise to 34% by 2050. McKinsey estimated last year that China’s health care spending will balloon to $1 trillion in 2020 from $357 billion in 2011. Even with a slowing economy, education will remain a hot zone as millions of Chinese enter the middle class — and demand better schools and teachers. Last year, Deloitte estimated that China’s private education sector — which includes after-school tutoring, test-prep, private universities, pre-school education, and continuing education — will reach a market size of $102 billion by 2015. English-language training alone has reached a market size of $4.8 billion. Foreign companies have a toehold in this market, offering Chinese students tutoring on tests like the SATs or GREs, along with other Western-style education programs. 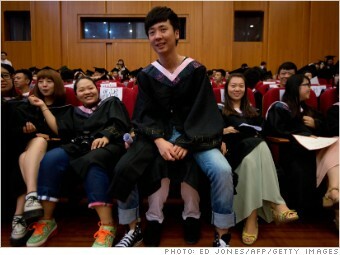 Higher-education institutions are also moving into China. In 2011, New York University announced a partnership with East China Normal University to form a campus in Shanghai. Last year, Stanford opened a research center at Peking University. And the University of Nottingham, an early mover, opened its doors in Ningbo in 2004. Some of the world’s most polluted cities are located in China, and residents are speaking out in greater numbers about choking air pollution and contaminated food. It’s no surprise, then, that the government has made the issue a priority, including in its latest five-year plan a series of measures to boost energy sustainability and clean energy. Unsafe drinking water is also a major problem, and Chinese media outlets have seized on the danger, raising the issue’s profile. Providing sufficient electricity to the nation is another need, said Bloomberg New Energy Finance analyst Nathaniel Bullard. 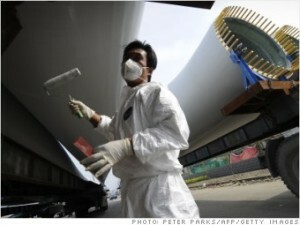 European companies Siemens (SI) and Schneider Electric(SBGSF) have jumped into this area. Others such as GE (GE), California-based solar company Brightsource and Danish wind turbine maker Vestas (VWDRY) have also entered the China market. 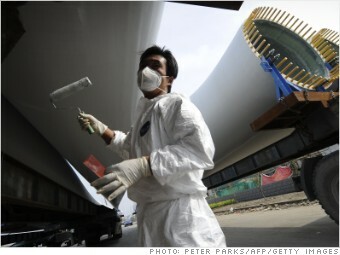 Last year, China spent heavily in the sector as clean energy investment hit a record $67.7 billion, up 20% from the previous year, according to BNEF. Dollars are expected to continue pouring in. 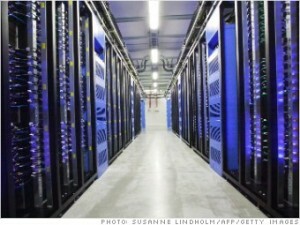 Businesses in China are looking to move filing, accounting and sales systems off physical servers and into the cloud. Large foreign companies that specialize in cloud services — a catch-all term for Internet-based services — such asMicrosoft (MSFT) and IBM (IBM)are moving into the China market, competing against local company Alibaba, which runs a major cloud service in China. Selling software for research, such as mathematical modeling, can also be potentially quite lucrative, China Market Research analyst Ben Cavender said. Mapping software company Esri, for example, has expanded into China, with locations in Beijing and Hong Kong. Internet businesses are also growing as Chinese shoppers go digital. 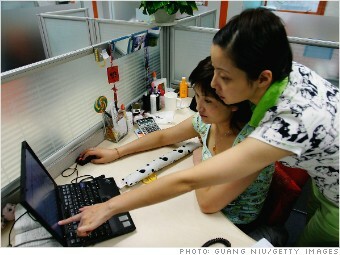 China’s online sales, or “e-tailing,” totaled $120 billion in 2011. That beat Japan’s online sales at $107 billion and the U.K. at $56 billion. Looking ahead, the Chinese market is projected to top $650 billion by 2020, according to a May study by consulting firm McKinsey. Amazon (AMZN) jumped into China in 2004, buying up a local online shopping site to reach the nation’s growing number of consumers. Local rivals include Taobao, run by Alibaba, and 360buy. The online boom should be supported by China’s 130 million residential broadband accounts — a number that will only increase going forward.